*These are very intense FLAVOR OILS. ENTIRE MENU BELOW We recommend usage at .05%-10% We Ship USPS 2 day Air. FLAVORS AND BUY BUTTONS LISTED BELOW ON THIS PAGE. Please click thumbnail photo to see detail with our new drop top caps. Chefs, Bar Tenders, DIY Vape manufacturers love these for classy application. The drop tops can also be adjusted to dispense one drop or 20 drops. You can even flavor your coffee with one drop (That is what we do!). New Mary Jane Flavor! Awesome duplicate. Water based is the medium most "herb" or "tea leaf" people use. We sell flavors that are specially formulated for high heat applications such as candy, dental and medical industries. 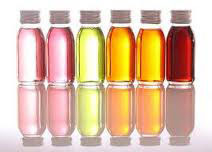 They are not extracts and have very little if any alcohol. They are not just "scent" but are real flavor and top scents. We cater to DIY flavor crafting. PG based flavors do not need to be "solved" as they are already water soluble. Our flavors are designed to survive a high heat application and they are not just extracts. What are our favorite flavors? Vanilla is always pleasing and seductive. So, Vanilla-Mint is very high on the list. Any mint for fresh breath and for digestive issues, ginger, cinnamon and the mints are always refreshing and helpful. Our top ten are: Blueberry, Candy Apple, Cherry, Grape, Juicy Fruitti, Margarita, Pineapple, Strawberry, Triple Berry, and Watermelon are the best sellers by far in the candy, tea and incense markets. Our spice blend is really warm and has vanilla in it. Coconut Raspberry is also tantalizing. Oil Based click here. 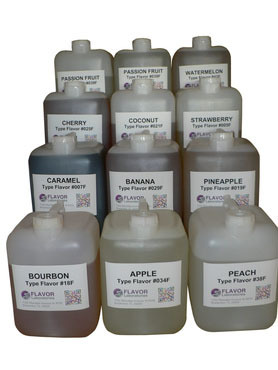 With this powerful kit you can make 145 popular flavors with 40 basic flavors. It comes with forty 8 ounce bottles of concentrated flavor. Flavor includes most every flavor on this entire page. For reviews of this kit click here. For new 2 Ounce Kit special at $499 please click here. To buy larger bulk candy flavor sizes please click here. International buyers must add to cart intl ship fees located in this link. Rich dark chocolate and creamy toasted almond. AVery spicy, exotic, aromatic and licorice like. Apple, Double Flavor PG Based New! Apple, Green Flavor PG Based New! A perfect blend of rich dark chocolate and succulent raspberries. To buy larger bulk candy flavor sizes please click here. Compare to Dr. Pepper Flavor. International buyers must add to cart intl ship fees located in this link. KIWI Flavor PG Based New! A strong and rich real kiwi fruit flavor. One of the most popular and hand selected flavor from our company. Similar to flavor notes in “Laffey Taffy.? – A bestseller and addictive. Staffs most favorite vaping flavor - period. – More fruity and less spicy than its black licorice relative. Emphasis is on a woody cherry berry. We feel in love with this flavor - it is sugary as well as vanilla minty and just so well done! To buy larger bulk candy flavor sizes please click here. Compare to Mountain Dew Flavor. International buyers must add to cart intl ship fees located in this link. Orange Tic Tac Flavor New! buy larger bulk candy flavor sizes please click here. International buyers must add to cart intl ship fees located in this link. As refreshing as a glass of lemonade on a hot summer day. Strawberry makes a faint appearance in our version. If you want color please select the punch below this one.